Work continues around a storage tank with the chemical designation MCHM, 4-methylcyclohexane methanol, the chemical that leaked into the Elk River, at Freedom Industries storage facility in Charleston, W.Va., Monday, Jan. 13, 2014. Legal fallout from the accidental chemical spill that affected the water supply for 300,000 West Virginians has landed at the doorstep of Kingsport, Tenn.-based Eastman Chemical. Eastman, a specialty chemicals manufacturer, is among the defendants named in a suit filed Monday in U.S. District Court in Charleston, W. Va., according to published reports. 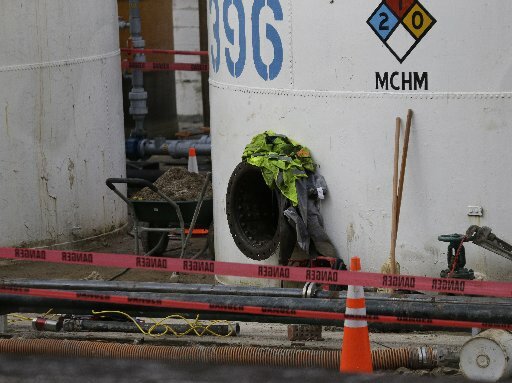 The spill came from a storage tank at a Freedom Industries, which is also a defendant in the lawsuit. Eastman has not commented on the lawsuit, according to the Wall Street Journal. So far the company’s stock price has not suffered. Shares were 69 cents higher at $79.98 in early afternoon trading today. Click here for a Bloomberg report on the legal fallout from the spill. Click here for a Wall Street Journal report. This entry was posted in Eastman Chemical and tagged 4-methylcyclohexane methanol, Charleston, chemical spill, coal processing, Eastman Chemical, Freedom Industries, MCHM, W. Va., West Virginia on January 15, 2014 by Roger Harris.